North Korea's former intelligence chief Kim Yong-chol will meet with Secretary of State Mike Pompeo in New York, according to the White House. North Korea's former top intelligence official Kim Yong-chol is visiting New York this week, in the clearest sign yet that the isolated country really wants to salvage the potential summit with U.S. President Donald Trump. The White House says Kim will meet with Secretary of State Mike Pompeo as part of ongoing talks about a prospective summit. Trump previously withdrew from participating in the summit but has signaled he might change his mind about that. Kim holds several high-level political and military titles in North Korea, including the ruling party's vice chairman for inter-Korean affairs. He's been on the front lines of North Korea's latest diplomatic outreach, appearing at the 2018 Winter Olympics in South Korea and the inter-Korea summit at the DMZ. 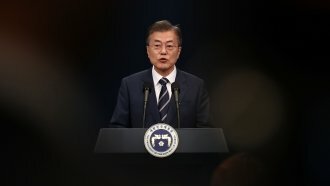 Kim has been a controversial choice for diplomacy: South Korea blames him for a deadly 2010 attack on a military vessel as well as the shelling of an island that same year. The U.S. has also accused Kim of orchestrating the 2014 hack that exposed thousands of emails from executives at Sony Pictures Entertainment. Kim is technically under sanctions from both South Korea and the U.S., but both nations have been willing to waive those sanctions for the sake of diplomacy. Kim's visit comes after a U.S. delegation crossed into North Korea for talks about the prospective summit. The two sides are still working out the stakes of the summit, including whether North Korea's nuclear program will be on the table.